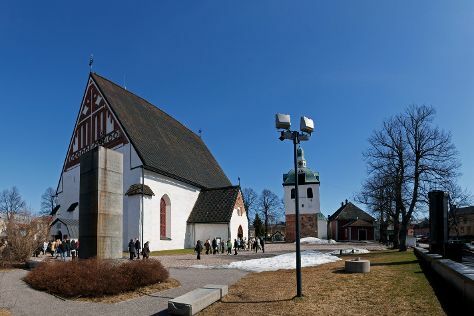 Cathedral of Porvoo and Stromforsin ruukki will appeal to history buffs. Appreciate the collections at Heureka, the Finnish Science Centre and Langinkoski Imperial Fishing Lodge Museum. Explore the numerous day-trip ideas around Porvoo: Sibelius Hall (in Lahti), Arboretum Mustila (in Elimaki) and Linden Esplanade (in Kotka). There's lots more to do: perfect your strike at Flamingo Entertainment Center, get some fabulous bargains at Fazer Experience Visitor Centre, and don't miss a visit to Porvoo Old Town. For other places to visit, where to stay, ratings, and other tourist information, read our Porvoo journey builder website . Helsinki to Porvoo is an approximately 1-hour car ride. You can also take a bus. In April, daily temperatures in Porvoo can reach 9°C, while at night they dip to 0°C. Finish up your sightseeing early on the 11th (Thu) so you can go by car to Jyvaskyla. Jyväskylä is a city and municipality in Finland and in the western part of the Finnish Lakeland. On the 12th (Fri), test your team's savvy at popular escape rooms, then take in the exciting artwork at Kuokkalan kartano, and then fly down the slopes at Himos Ski Resort. On the 13th (Sat), you'll have a packed day of sightseeing: fly down the slopes at Laajis. To find traveler tips, ratings, reviews, and more tourist information, you can read our Jyvaskyla trip planner. Drive from Porvoo to Jyvaskyla in 3 hours. Alternatively, you can fly; or take a train. Traveling from Porvoo in April, Jyvaskyla is slightly colder at night with lows of -3°C. Cap off your sightseeing on the 13th (Sat) early enough to go by car back home.